Originally, only OH 7 cranial material was identified, includes an almost complete left parietal, a fragmented right parietal, a nearly complete mandible, all lower teeth, and right maxillary dentition from incisors to the first molar and a left second molar2. Based on the fragmentary parietals, the cranial capacity is estimated to be approximately 674 cc. 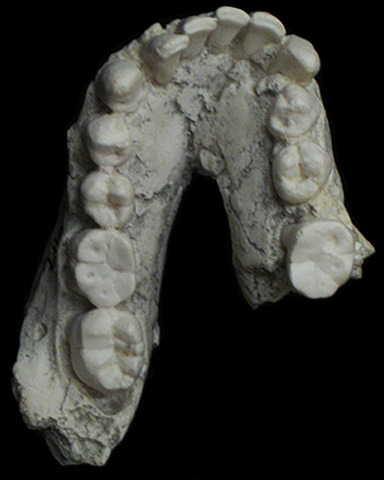 The incisors are relatively large compared to those of Australopithecus and Homo erectus, and the postcanine dentition is relatively long and narrow compared to australopith2. In addition, the canines are relatively large compared to the premolars1. The chin region is beginning to retreat and there is little evidence of a mental trigone. The jaw (maxilla and mandible) is relatively reduced compared to australopiths, but does fall inwithin the range of variation of both Homo erectus and Homo sapiens1. The postcranial material consists of hand, wrist, finger, and some foot bones2. These are similar in size and shape to the hand bones of later Homo species, and represent part of the reason this species was placed in Homo instead of Australopithecus. The increased brain size separates this species from australopiths, but the overall primitive characteristics of the specimen also prevent its placement in any other later Homo species. Gnaw marks on the distal ends of the foot bones and the lower margin of the mandible suggests damage by carnivores2. Johanson D and Edgar B. 2006. From Lucy to Language: Revised, Updated, and Expanded. New York: Simon and Schuster.